When a person intends to clean items around the house, it can involve a lot of elbow grease. However, there is equipment available to make the job much easier. Grime on sidewalks, siding, and patio furniture will be a thing of the past when using a power washer. There are numerous things to consider before buying a power washer. Equipment is available in all price ranges, pressure, and different gallons used per minute. It is important to understand the difference between items that run on gas or electricity as well. All of these aspects will be important depending on how the unit will be used. Here is an in depth look at an AR Blue Clean AR118 review. 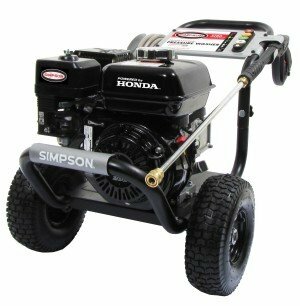 There are a few aspects of a pressure washer that a homeowner must consider. The first thing to uncover is the PSI. An average machine will include PSI between 1300 and 2600. This AR Blue Clean unit provides 1500 PSI. This number represents the actual amount of power used to force grime away from the objects being cleaned. GPM stands for gallons per minute of water that the unit uses at a set pressure. This power washer provides 1.5 GPM. The most important part of buying a power washer is choosing the correct ratio of GPM to pSI. Cleaning units is a vital thing to include in this AR Blue Clean AR118 review. Understanding cleaning units will allow consumer to make an informed decision by comparing various products. This number explains the effectiveness of the washer at removing dirt. To calculate this amount, a person must multiply the water flow by the stated PSI. Usually, the higher the number, the better the machine will be at cleaning away debris. This product has 2250 cleaning units. It will work well around the home to clean items like decks, outdoor furniture, sidewalks, and even the car. This washer includes a 3 axial piston wobble plate pump by Annovi Reverberi. It will provide adequate ability to complete basic chores around the house. Most pumps are similar to the one in this unit and comes attached to the motor. Most people will read this AR Blue Clean AR118 review to understand how it is powered. There are gas and electric options on the market. 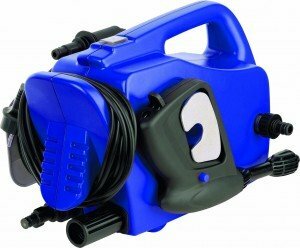 This product runs on electricity and includes a hose that is 30 feet in length. The hose on his power washer is 20 feet in length. 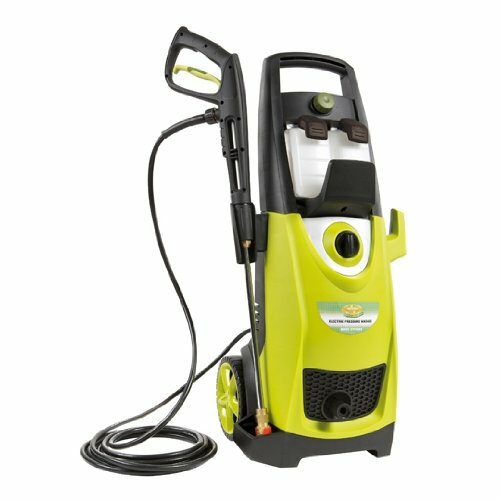 This power washer has an adjustable nozzle that can go from a wide fan jet setting to a thin pencil like flow. This will be convenient and versatile to use on various objects. 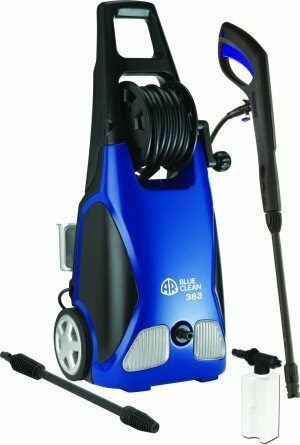 Since this is a portable and handheld power washer, it is extremely lightweight. The unit itself weighs under 20 pounds. It is easily held in one hand. To add to this AR Blue Clean AR118 review, it is necessary to mention additional positive features. To begin, the unit has a special design that lets a user mount it to a garage wall or carry it in hand. To keep all things in place, there is a built in compartment to store all accessories. There is also a bottle that can be attached to hold soap. There are abundance of safety features included like a Total Stop System, safety lock, and safety valve. Despite its small size, it is a capable machine that will supply years of cleaning ability. The moor is strong and provides over 11 amps of power. Due to the very low price of this unit, there are no major accessories included. However, a person may be interested in purchasing an extension cord for the unit. The longer the cord, the further away an object can be to get adequately cleaned. This is especially useful when trying to clean the siding of a house. Other customers may prefer to purchase a universal gun replacement kit as well. The weight of this unit may fool consumers into thinking that it will not be able to tackle stuck on grime. However it is extremely capable of cleaning all surfaces like sidewalks, siding, and patio furniture. The Total Stop System will control power to the unit, allowing for an automatic start and stop. There is also a safety lock to keep the trigger from accidentally engaging and causing injury. Finally, there is an automatic safety valve with a pressure shutoff at the head of the pump. To simplify connection, there is a garden hose adapter that includes a built in water filter and automatic water check valve. 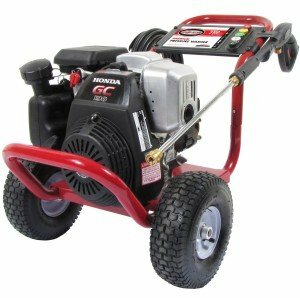 If you want to have higher PSI pressure washer that come with accessories, you can check ar383 review here. Despite the high praises for this power washer, it is essential to discuss a few complaints in this AR Blue Clean AR118 review. Some customers would have liked the convenience of having an angled wand, which is not included with this unit. An angled wand makes it much easier to wash a car. There is a wand like this available for separate purchase. Some people have complained that the hose adapter tends to leak. This is a simple fix by heading to the local hardware store and bringing a new brass replacement. It is important to take a look at how well this piece of equipment is rated by fellow customers. This power washer averaged 4 out of 5 stars based on 112 customer reviews. This is an accurate display of the machine’s usefulness. Some commercial grade power washers can cost over $1000. This unit is meant to be much smaller, compact and portable. It comes with an extremely affordable price under $100. Even though it does not have the power of the more expensive units, it definitely will work well for the average homeowner looking for a way to clean items without the need to exert physical strength. Hiring a professional power washing company to come to the home can cost thousands to get the same results as this machine will provide. It is perfect for use around the home and includes many features that will make it a “go to” piece of equipment for many years.